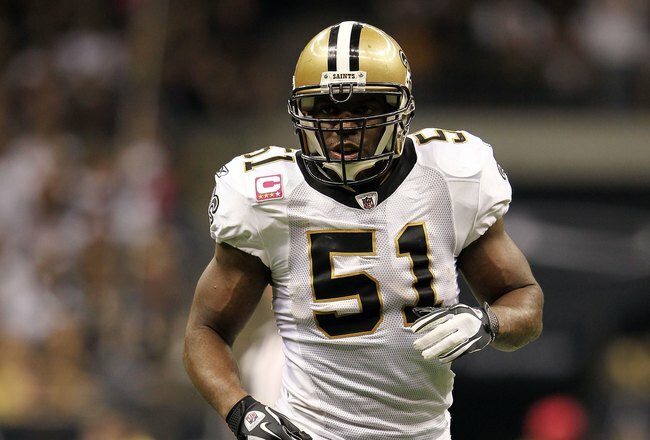 3x Pro-Bowler Jonathan Vilma won’t be playing for the Saints this year. At lunch time today the NFL finally announced the punishments for player involvement in the New Orleans Saints bounty program that was allegedly run starting with the 2009 season up until the end of last season. As many as 27 Saints players may have participated in the program that paid out improper cash benefits for hits that took opposing players out of games (most notably targeting Kurt Warner, Brett Favre, Aaron Rodgers, and Cam Newton), and today four current and/or former Saints players were handed down suspensions for their role in the program. Most notably linebacker Jonathan Vilma has been banned from participating in the entire 2012 NFL Season and stands to lose $2.2 million dollars with his suspension. Luckily for Vilma he recently restructured his contract to help with the Saints salary cup numbers and lowered his base salary $5.4 million dollars down to $1.6 million for this season. Vilma will also lose a $600,000 roster bonus and his punishment begins immediately. 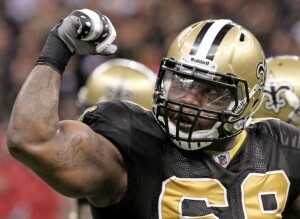 The Saints current team will also be missing defensive end Will Smith for the first four games of this season. Smith, who had 35 tackles and 6.5 sacks last season for New Orleans, received a four game suspension without pay, but he, like Vilma, restructured his contract this off-season as well. Smith was able to convert $7 million dollars of his salary into a bonus, leaving just a salary of $825,000 that he will lose just under a quarter of with the suspension. Two players who not currently still with the Saints will be suspended as well. Defensive tackle Anthony Hargrove, who is now with the Green Bay Packers, received an eight game ban and linebacker Scott Fujita, now with the Cleveland Browns, will sit out three games. Hargrove will lose $388,000 of his $825,000 salary and Fujita will lose about $645,000 of his $3.6 million dollar salary. All four players will appeal their suspensions, but because they are in violation of the NFL’s player conduct policy the appeals will be heard by NFL commissioner Roger Goodell. In a statement released this afternoon by Goodell he said “”It is the obligation of everyone, including the players on the field, to ensure that rules designed to promote player safety, fair play, and the integrity of the game are adhered to and effectively and consistently enforce. Respect for the men that play the game starts with the way players conduct themselves with each other on the field”. Goodell also added “In assessing player discipline, I focused on players who were in leadership positions at the Saints; contributed a particularly large sum of money toward the program; specifically contributed to a bounty on an opposing player; demonstrated a clear intent to participate in a program that potentially injured opposing players; sought rewards for doing so; and/or obstructed the 2010 investigation”. Taking all that into account, I would be very surprised if the suspensions for these players was reduced at all following their appeals. The NFL’s investigation into the Saints is far from over as league officials would still like to know more information about what actually occurred in the team’s locker and meeting rooms, and what impact it had on the field in regards to player safety. Also, in between the time that the coaches suspensions were announced (which you can read about here: http://wp.me/p2h1Lv-2d) and today’s player suspensions, the Saints have been accused of rigging General Manager Mickey Loomis’ booth in the Superdome so that he could hear opposing coaches use of in stadium communication systems. ESPN announced through anonymous sources that there was a setup in place that would have allowed the Saints GM to eavesdrop on opponents from 2002 to 2004, and doing so would violate not only NFL rules but also state and federal laws. The Louisiana State Police and the Federal Bureau of Investigation are both looking into the allegations, and if the Saints are found guilty it would be not only a huge blow to the team and to Loomis, but also the sanctity of the NFL and the spirit of competition. 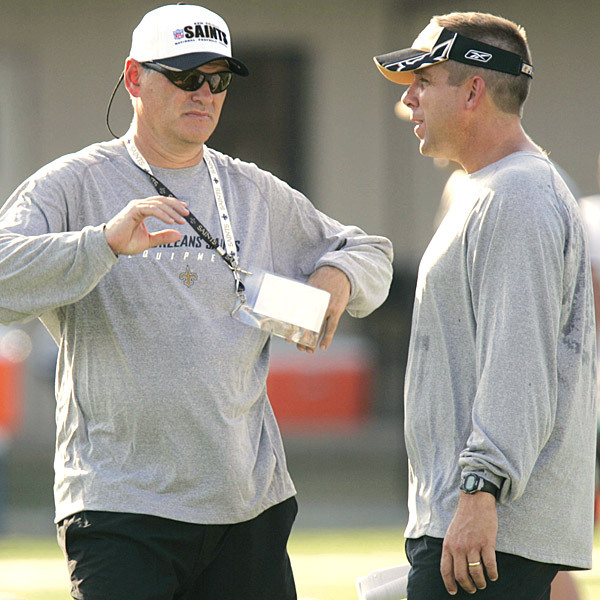 Saints GM Mickey Loomis (pictured with also suspended head coach Sean Payton) could be in even more trouble with both Goodell and the real law. Today is not a great day to be a fan of the New Orleans Saints and it is even worse if your name is Jonathan Vilma, Anthony Hargrove, Will Smith or Scott Fujita who in addition to missing games will lose substantial sums of money for their role in the bounty program. The other 23 or so players who potentially were involved in this behavior may breathe a bit easier today, but they are not in the clear just yet. Hopefully everyone involved in these scandals will learn that while the NFL is big business, it is still just a game. What’s the point in playing a game if you got to cheat your way to victory, and today these four players learned the hard way that cheating never pays. This entry was posted in NFL and tagged Bounty, Football, New Orleans, NFL, Roger Goodell, Saints, Sports, Suspensions. Bookmark the permalink.